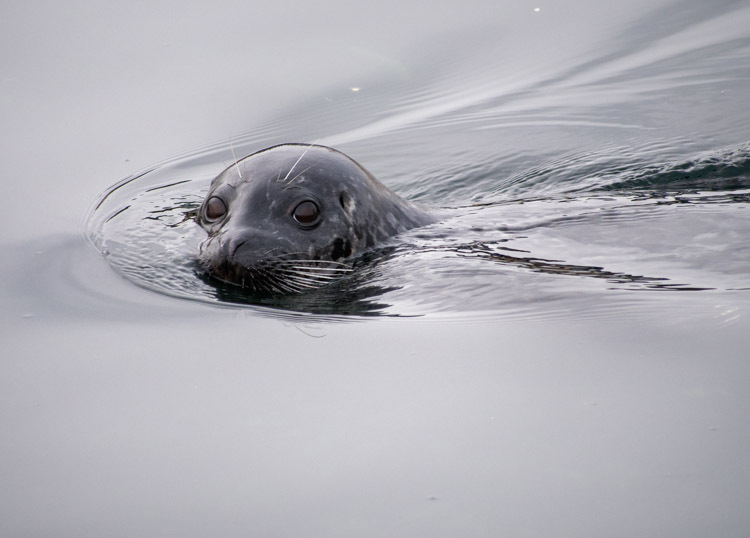 “She” could be a “he,” this harbor seal, and only she knows — stirring from the depths and shallows of Elliott Bay, gliding, reflected alongside us. She rounds the rock bend … she, the fusiform one, tapered and sleek … propelled through the tide by hind flippers. 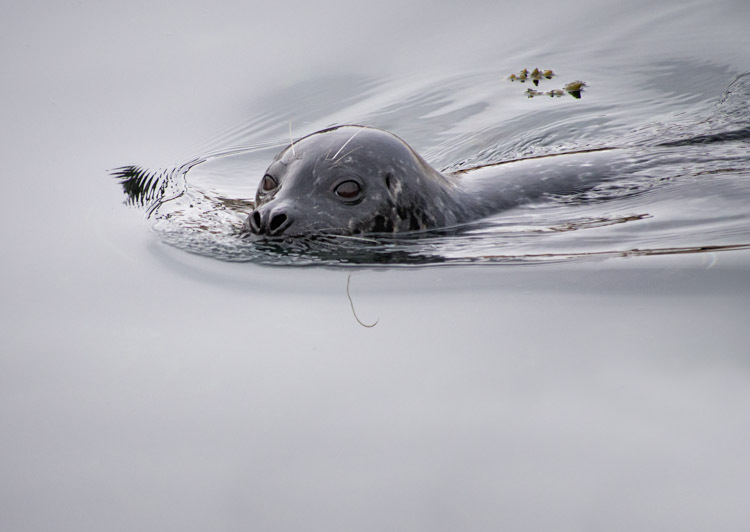 In a pinniped world where there’s no strong, visible distinction* between she and her male, I err on the side of feminist acknowledgement and call her “she.” She, Phoca vitulina, with vibrissae (whiskers) so sensitive they send signals of fish to her seal brain. And she, who can plunge 300 feet and stay for a quarter hour, contracting her blood vessels and quelling her pinniped heart. I hesitate to point my lens, thinking she might submerge her moonbeam eyes and disappear into the deep. But she stays, looking back as we look at her, granting us a few moments, a privilege, as she pierces the divide between brine and breath. With a final spin, the high waters pour over her pelage, a coat that can be pale, pewter, silver or coal and spotted — unique as a fingerprint. She twists her head to us just one more time before sinking, languid — engulfed by the bay — and at one with the sea. 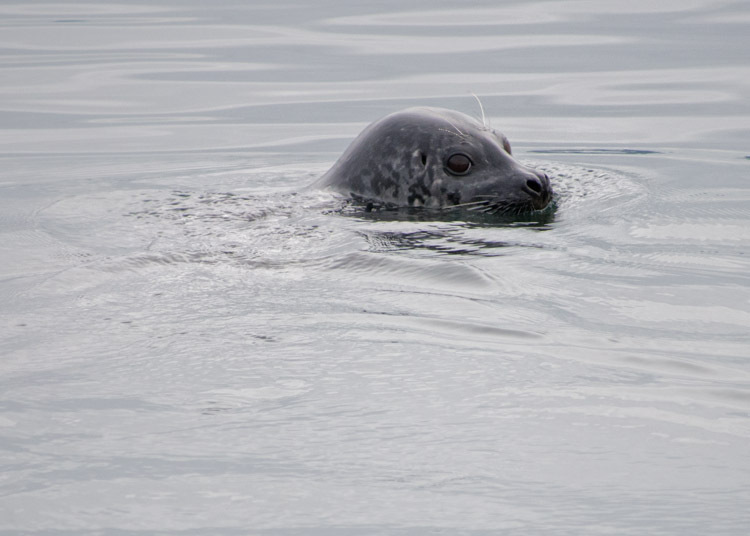 * There’s little sexual dimorphism in harbor seals. Males tend to be slightly larger but it’s not a reliable measure since sizes can vary regionally, as well. Those eyes are irresistible. Their whiskers are prodigious and said to contain sensory organs that, as you mention, help them find fish. I also didn’t know they were known as “Pinnipeds”. I ordered Caroline Fraser’s “Rewilding the World.” The experience I had with the urban Monarch will make me enjoy that book. I’m convinced that it was a lesson I had to learn. To think that Nature “belongs” to “sanctuaries” and “refuges” is an OK idea. It’s the idea that everyone grows up with. The idea that Nature is “pristine” (and it is, I’m not disagreeing with this) and that you really have to go “out into the wild” to see “Nature”, is a somewhat misconceived paradigm. “Nature” can be in your own backyard, in the places most unimaginable and inconceivable; yet it’s there. Even if it’s a micro ecosystem, it’s thriving by your side. The book I plan to read again that I read when I was much younger is Konrad Lorenz’s “King Solomon’s Ring”. He’s considered one of the founders of modern ethology, and the book is very readable and humorous.